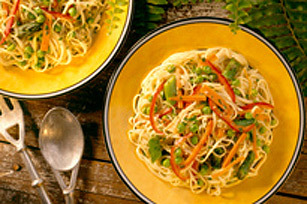 Use whatever colourful fresh vegetables are in season in this springtime vegetarian dish. Cook 8 chopped asparagus spears, 4 minced garlic cloves, 1 each red pepper, carrot and leek (cut in thin strips) in 1 Tbsp. butter, stirring occasionally. Stir IN 1 can (10 oz/284 mL) chicken broth and 2 Tbsp. lemon juice. Bring to boil. Add 1 cup frozen peas. Cook 375 g Linguine according to package directions; drain. Toss with vegetable mixture. Top with 1/4 cup each Kraft Grated Parmesan and chopped fresh Italian parsley. Discard green and root portion. Cut remaining white part of leek in half lengthwise. Clean between each layer of the leek under running water.